White walls - having white walls can help in many ways starting with it being a pleasing & clean background in your images. They reflect clean neutral light into the room and onto your skin which is an important element, so we love as much of that as we can get. Let’s be honest not a single person wants puke green walls in their wedding gallery. Blake and Kristy have been together for 9 months and got engaged back in October while on a trip to New York City with their families. They love staying in cooking Pinterest recipes together and love making puzzles together. Date night looks like sushi followed by a movie back home with lots of cuddles. Sounds perfect to me! We danced and ran through the tall pines and the gleaming light for Brea x Jacob's Woodland Adventure Engagement Session. The light was buttery and their love was deep. When Mikey called me in October of 2016 and asked me if we could be in St. Louis during the month of October this year, I was curious about what he was planning. He quickly told me his plans for asking Brittney to be his wife and that we would have to be careful about our conversations here on, because it was a surprise proposal. The day had finally arrived and we met Mikey along with a group of their friends and family. 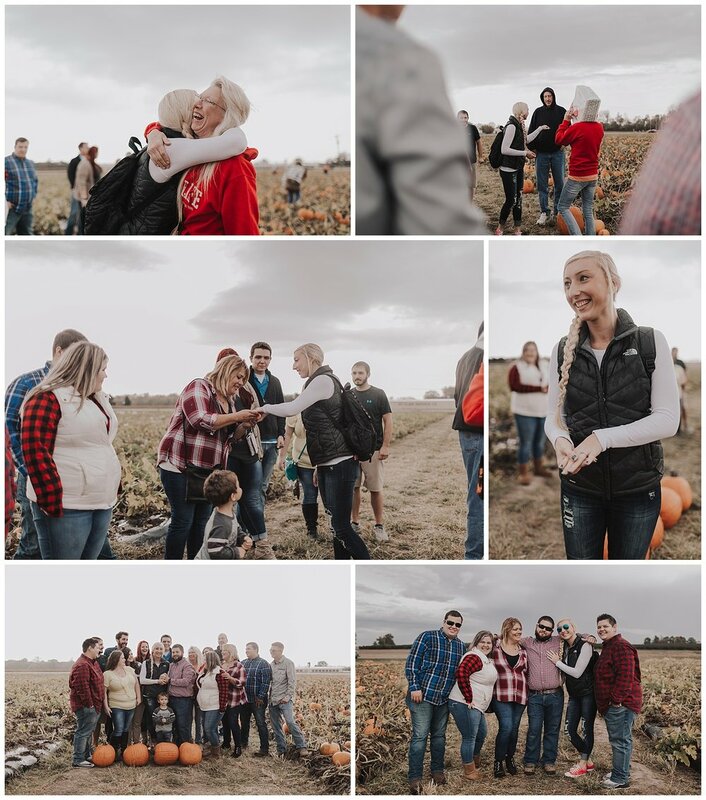 Since it's been almost a year since we've last seen him; we grabbed some hugs, a peek at that gorgeous ring, and headed out to the pumpkin patch. 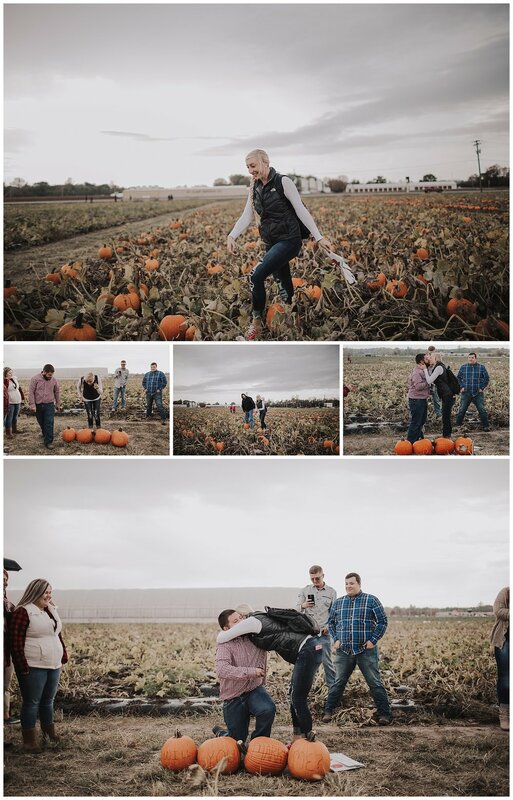 Huddling under an umbrella and trying to blend in with our surroundings as Brittney and her family searched through the patch looking for the perfect pumpkin. When Mikey yelled out "Hey, Brittney!" She turned around and I swear, I saw her jaw drop. She couldn't find the words and looked at her Dad, you could tell she was searching for what she should do next, when her Dad said, "Go to him." She quickly climbed over the pumpkin vines and made her way to Mikey, down on his knee, in front of the pumpkins laid out reading "WILL YOU MARRY ME?" Brittney says, "My favorite part was everything! I was completely surprised! I'm surprised I didn't poop myself! I still can't believe he actually proposed after all these years and him telling me it was never going to happen. He pulled it off! I love how he planned it out for over a year & picked out the ring by himself. I love that he included our family, friends, and Elle x Troy came in town to take a once in a lifetime photo op!" TEN YEARS these two have been together. Brittney and Mikey first met in middle school and later reconnected in high school.We knew each other from middle school and reconnected back in high school. They fell in love and have been laughing at each other ever since. These two are the kind of people that create adventure & laughter wherever they go. Brittney loves to scrapbook and Mikey is always busy working on a project knees deep in tools. Together they love going out to eat (especially Pizza), finding new places to check out, and searching through flea markets and yard sales. Brittney say " We never have a dull moment in this relationship. With my blonde moments and his humor, we are always making people laugh!" Last year they bought their first home together and they found out a few things about each other that apparently are not deal breakers, because here they are engaged. Mikey found out how OCD Brittney is and she found how particular he can be. She also fell in love with his dog and says he's her world. An ideal date night for these two looks like Imo's Pizza (for those of you not from St. Louis, Imo's is the best pizza ever!) and a movie! Mikey thinks Brittney is cute, caring, determined, intelligent, self motivated, and stubborn. All things he loves about her. Meanwhile, she says similar things like; "he's adventurous, caring, loving, determined, & stubborn. He's my everything! I could never imagine him not with me. My supporter!" Winter Mini Sessions - Available NOW! 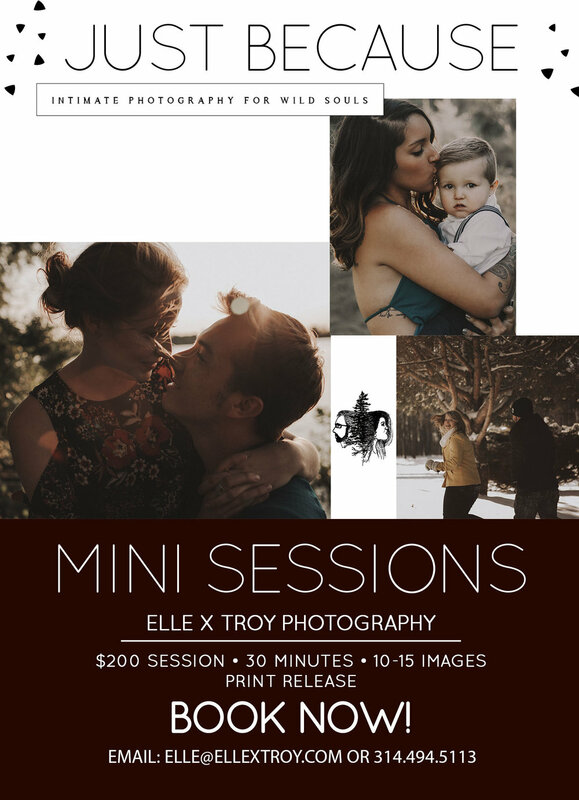 For the first time ever we are offering MINI SESSIONS. Why now, you ask? It's here already. Winter that is, and I was not ready for it for the first time in years. I love cold weather, like really love it. So with that being said. Our Wedding Season has ended for the year and I'm just not done snapping photos of rad people who become our friends. Couples in love. Be it your engaged, married, or somewhere in between. We love capturing your story at any stage along the way. My biggest regret in Marriage is not having our photos taken at least once a year of Troy & I. Single parents! We think your incredibly strong and deserving of a cost break. Let us document you and your littles playing and spending some much desired time together. Maternity. 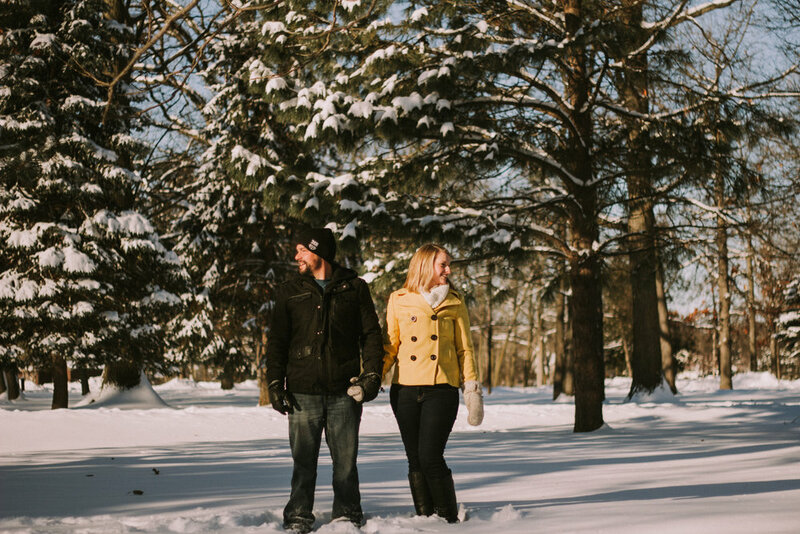 A great way to get a Winter Maternity session and not have to bare the cold for very long. No one should miss out on baby bump images because it's frigid. Small families. This includes families with one child who wants some fun images of their family spending time outdoors running and playing and spending some good quality time together. What to expect: I am a huge lover and promoter of spending quality time with your loved ones, which usually looks like being in nature running around unposed and only slightly directed. We do always sneak in a few portraits to please Grandma and one for Mom's wall. Otherwise, my prompts are low key. We spend your session going through the typical motions of life, as you would when I'm not around. For couples this looks a little different and there's a bit more prompting of loving on each other. Who wouldn't want to spend some time snuggling and kissing on your loved one? 30 minute session with Elle. EMAIL to reserve your spot today! Only a few spots left, our schedule is filling up fast! Location: We have two locations, our morning and evening spots will be different due to lighting. Both locations are beautiful this time of year. Location will disclosed in our email. To save your spot we require a $50 retainer. The remaining balance is due at the time of service. Spots are limited and this is the first time we have ever offered mini sessions. This is a BIG deal for us. Send us an email to brighten our day letting us know your interested and a email will be returned to you within 24 hours giving you all the details and offering of times! We can't wait to capture your love, be it with your significant other, your child, or your little family. Email elle@ellextroy.com to schedule your session today! When Chris's friend noticed a new girl moved into the neighborhood and wanted to go check her out for himself. Little did he & his friend know Chris would be the one to fall in love with this fun loving, down to earth, sweet in every way girl named Jess. Erin and Casey love the outdoors and spending time together. They are hikers who enjoy camping. Catching snowboarding runs in the Winter. And like true Wisconsinites they love their Packers Football and beer. Casey is goofball and keeps Erin laugh constantly. Lovers of the outdoors, Candice came up with the wonderful Gone Fishing Engagement Session. The beginning of their relationship revolved around a lot of fishing, relaxing, bonding, and falling in love. Tiffany is creative, a natural beauty and easy going, there's no wonder why Nate loves her so much. Nate is smart and charming and they both enjoy playing with their two pups Mazy and Luna. It was such a pleasure getting to know this couple. Two of the sweetest people I've ever met. Clearly made for each other, these two kind hearts made each other smile constantly. We actually did this engagement session the evening before their Wedding. Such a fun way to spend the big night before, relaxing and loving on each other before the big day. Eric and Kate were obviously not nervous at all, we just walked around Soulard snapping photos before heading over to their Rehearsal at The 9th Street Abbey.